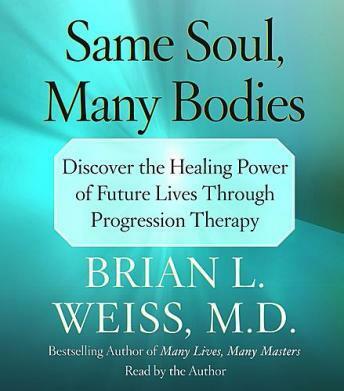 Noted psychiatrist Brian Weiss made headlines with his pioneering research on the healing power of past-life therapy in his million-copy bestseller, Many Lives, Many Masters. Now, in his groundbreaking new audiobook, Dr. Weiss reveals how our future lives can actually transform us in the present. What we do in this life will influence our lives to come as we evolve toward immortality. Dr. Weiss encourages this important recognition because recently he has not only regressed his patients into the past, but has progressed them into the future. Dr. Weiss demonstrates the therapeutic benefits of progression, just as he has proved that journeys into our past lives can alleviate or cure our physical and emotional wounds in the present. Same Soul, Many Bodies is a revolutionary audiobook that will take his millions of readers into an individual and collective future that they will create. In the process, their present lives will be profoundly transformed, and they will find more peace, more joy, more healing. The book was just a lot of what Dr. Weiss has written about in the past. If you read his first book, Many lives Many Masters well this is just a repeat although not as well written as that one. I would rent his others before this book and I wouldn't start here if this is your first book. I'm never disappointed in Dr. Weiss's books. This one is about the possibility of visiting future lives rather than past lives.. Fascinating as always.